Marketing in it’s simplest is communication, a conversation through which we tell others what we have to offer or need. 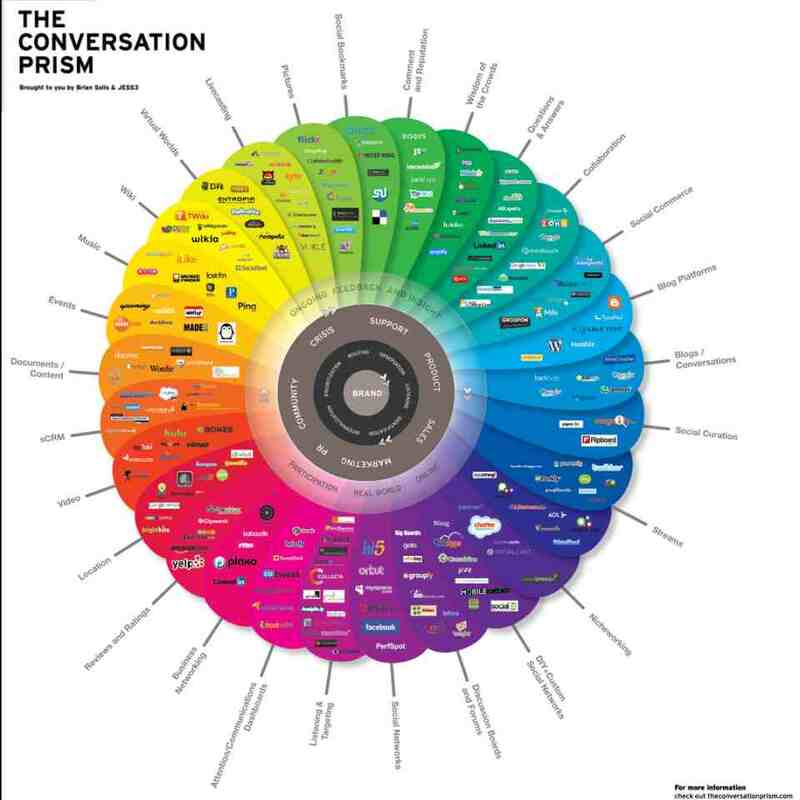 Technology has creted a whole new set of tools in this Conversation Prism and mastering an understanding of them is just the first step to utilizing them. This weekend I was blessed to be at BarcampNYC at Microsoft offices. In the the digital marketing session, there was so much information I taped the session but will review and share at a later date. There were so many great tips and apps! To prevent multiple posting to my various social media groups I opted to create this post and point to these tips. inquire about their well being and open up the channels to communicating. Before building yout “outpost ” on Social media sites, get your website and design your central contact info. there is no excuse. I use a self hosted WordPress install. My host DREAMHOST are among the best! were a team they do the heavy lifting so i can host my own domain. It is their support that rocks! here is a special Promo Code “MYWEBSTORE2013” that will give you $28 off 119 yearly hosting and free domain. You can host an unlimited no of domains with this account. My theme is cool and free – but I may change it a bit later . It is the monthly maintenance and upgrade that is time intensive. Your General – Call to action – contact me to discus how I can help your creative busienss grow. or Check our sales page for latest discounts! http://marketing.grader.com/ I run my sites through and test the results against my goals and the results I know I’m receiving. My marketing goal is not increased numbers but more targetted customer attraction and retention, as well as delivering better quality to existing customers.